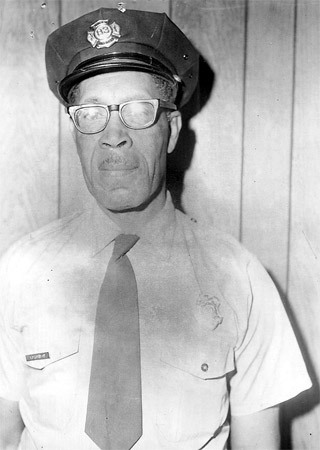 ANDREW DECKER ROBINSON was born in Chattanooga, Tennessee on October 18, 1911 to Lonnie and Idella Robinson. The family does not show up in Camden City Directories of 1924 and 1927. The 1929 directory indicates that Lonnie Robinson had died. Andrew D. Robinson and his widowed mother were then living at 906 South 7th Street in Camden, New Jersey. When the Census was taken in April of 1930 Andrew Robinson and his mother were still living at 906 South 7th Street. This lock of is referred to in the Census as Railroad Avenue; this however, is erroneous. Andrew Robinson married Ella Mae Mapp around 1938. The Robinsons she would have eight children- Joyce, Baby, Carol, Andrew, Jeannette, Barry, Judy and Gayle. 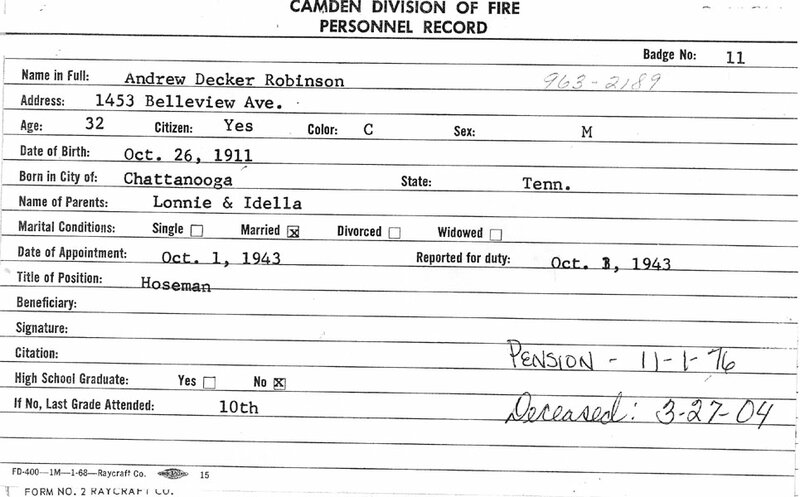 On October 1, 1943 Andrew D. Robinson was appointed to the Camden Fire Department, and assigned to Engine Company 1 at 409 Pine Street. He served the City of Camden with Engine Company 1 for 30 years. 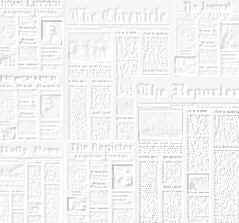 Andrew D. Robinson began collecting his pension on November 1, 1974. 1956 the family had moved next door, to 724 Division Street. The 1959 New Jersey Bell Telephone Directory list Andrew D. Robinson at 1453 Belleview Avenue in Parkside. 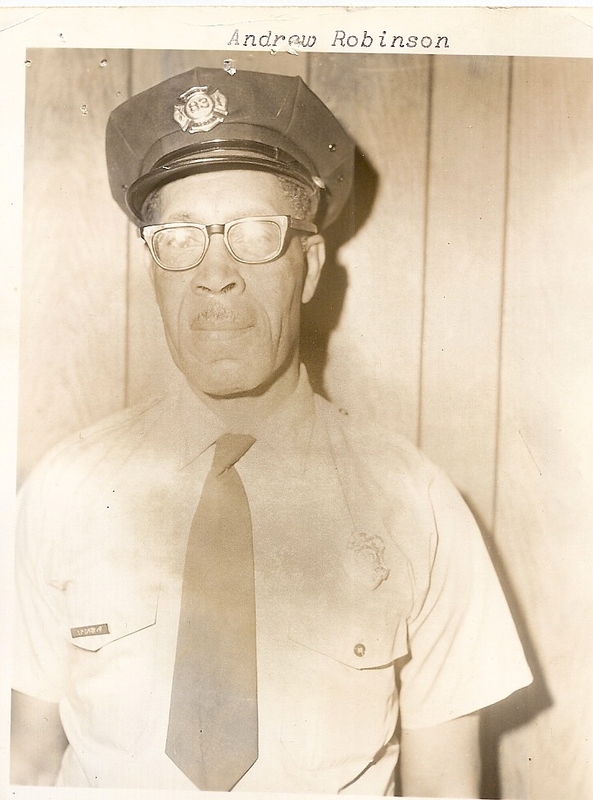 Andrew D. and Ella Mae Robinson were still living at 1453 Belleview Avenue when he retired from the Fire Department, and were still at that address as late as 1980. They later moved to Willingboro, New Jersey. Andrew D. Robinson died on March 27, 2004. Circa 1949- Engine Company 1, wagon and pumper at front of quarters, South 4th & Pine Streets, South Camden. 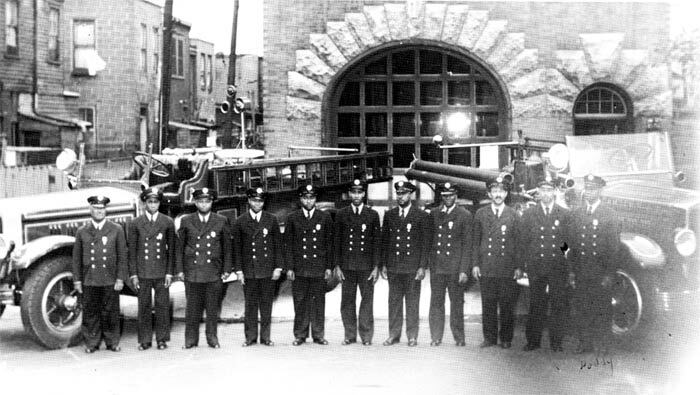 From left: Firemen Alfred Green, Fred Henderson, Charles Cook, Leroy Hatchett, Robert Thomas, Andrew Robinson, James Richardson, Eugene Alston, James Clinton, Captains Jesse Jones and Raymond Amos. September 1954- Roll Call at the housewatch desk of Engine Company 1 's old quarters, South 4th & Pine Streets, South Camden on the occasion of Fireman Charlie Cook's retirement following his last tour of duty. 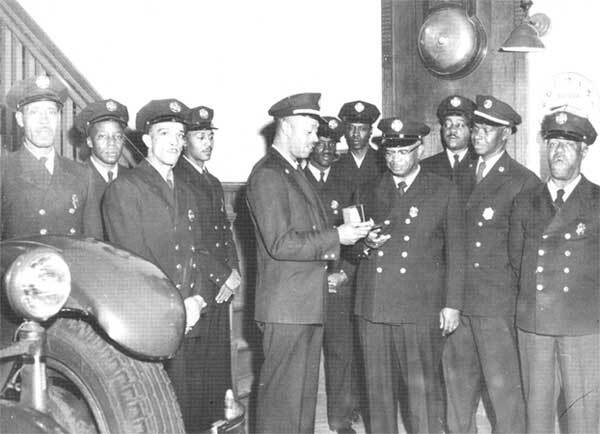 From left: Firemen Andrew Robinson, Eugene Alston, Theodore Primas, Charles Davis, Captain Jesse Jones presenting wrist watch, Firemen Jesthroe Hunt, Samuel Fisher, Charles Cook, Orville Goldsboro, Captain Raymond Amos, Fireman Alfred Green. Of Willingboro, NJ passed away Saturday, March 27, 2004 at his home. He was 94. He was the father of the late Joyce Irene, Baby Robinson and Carol Corsey. Mr. Robinson was a retired fireman with Camden City's Fire Dept serving 30 years on Engine Co #1 as a pump operator. He finally was employed by Garden State Race Track as fire marshal. He is survived by his wife of 66 years, Ella Mae; 5 children, Andrew, Jeanette Smith, Barry, Judy Wallace and Gayle Goldsboro; 3 sons-in-law, Murray Smith, Wayne Goldsboro and Morris Corsey; 2 daughters-in-law, Maxine and Dorothy Robinson; 19 grandchildren, 15 great grandchildren, 1 great great grandchild; 3 sisters-in-law, Cora Gaines, Laura Burke, and Edith Brimm; 2 brothers-in-law, James Mapp and Charles Brimm; a host of other relatives and friends. Services: Monday, 11am at St. Augustine's Episcopal Church, Broadway and Royden Sts., Camden, NJ where friends may call after 9am. Interment: Harleigh Cemetery. Arrangements by CARL MILLER FUNERAL HOME..
.....about my grandfather Andrew Robinson. This brought back many great memories of my grandfather. He was truly a great man. He loved his family and was there for us through may difficult times in my life.